Sean Tomasetto and Laura Myers act out their scene from “Almost, Maine,” during rehearsal at Cherry Hill High School West on Dec. 20. A young woman hits a young man square in the head with an industrial-sized ironing board. Two best friends spontaneously and repeatedly faint in each other’s presence. The amount of love given between a man and woman during the course of a long-term relationship is quantified in the size of red bags. A young man finds himself literally diminished after losing hope he’d ever find love. “Almost, Maine” is a work by John Cariani, comprising 11 short scenes — including a prologue and epilogue — within nine short plays, all taking place simultaneously, that explore love and loss in a remote, mythical location in America’s northeasternmost state. On one cold and magical night, the citizens of Almost — not organized enough for a town, too populated to be considered wilderness — experience the life-altering power of the human heart. Relationships will end, begin or change beyond recognition. Strangers will become friends, friends become lovers, and lovers turn into strangers. Junior Perry Gallo may not have entered into acting and this heady subject matter with purely altrustic intent, but he’s clearly caught on and remains enthusiastic the work ahead will pay off. During rehearsals at West on the evening of Dec. 20, eight principal actors and their three-student production team were jovial but focused during scene blocking and running through their lines over the course of multiple scenes. 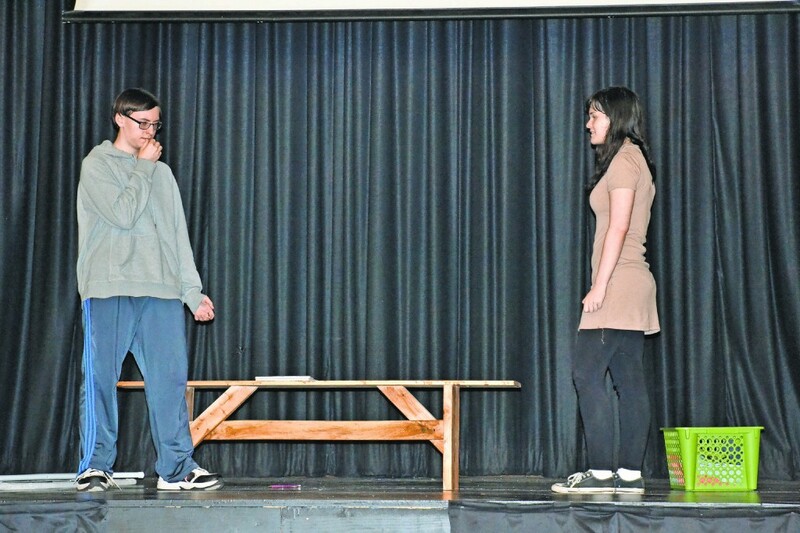 It was a significant departure from the usual fall play, spring musical aspect of high school productions, where one actor is expected to play one role and difficulties may arise in the execution of singing, dancing and line memorization. As an ensemble piece, “Almost” demands each actor take on at least two, and in some cases up to four roles, at one time. Young minds, with upcoming holiday break on the brain, needed to be as flexible as possible when inhabiting more than one personality within the play’s different vignettes. The same thing can be said for adults in charge of providing guidance and focus to the production. “I like directing and I really enjoy working with the students in this capacity, to see how they take their characters from the first time they read the script to the time when they actually perform it,” said Katelyn McWilliams, director and co-advisor of Cherry Hill High School West’s Theater Workshop. Junior Megan Nutt will bear the heaviest load of her peers, having to inhabit the roles of Ginette, Suzette, Lillian and Gail, but for her it’s a labor of love. Sean Tomasetto, a senior who will assume the roles of Steve, Randy and Dave, and who is tasked with some of the play’s more physically-demanding moments, approached this production and his work within as a calling. “Almost, Maine” will be performed on Friday, Jan. 11 at 7 p.m., Saturday, Jan. 12 at 2 p.m. and Sunday, Jan. 13 at 2 p.m. at Cherry Hill West’s auditorium. To purchase tickets, or for more information about the show, call (856) 663–8006 ext. 1224.